Join Sarah Negly from Gurney's as she roasts coffee beans straight off a home grow coffee tree. Find out how long to roast for different flavor preferences, along with her reaction to the coffee's taste! Hi, this is Sarah Negly with Gurney's and we're doing the third in our series of coffee videos and we're finally ready to roast our beans. 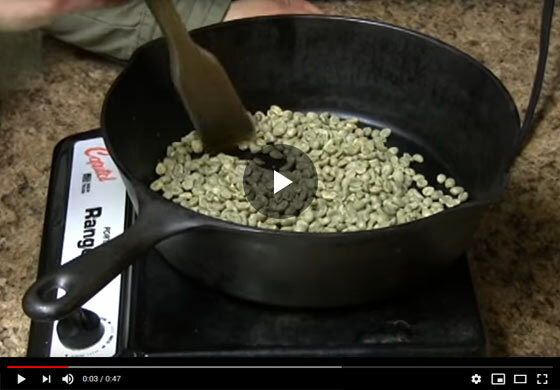 Okay, we've got a hot pan, we're just going to pour in our green coffee beans. Then you want to keep a constant stir when you have these going on the range, those other ways you can roast these, you can do them in the oven on a cookie sheet and you can even do them in an air popcorn popper. So this is the fun part of the process where you get to decide how long you're going to cook these beans and what you want, the flavor to be the longer you cook them, the darker, your beans going to get and the more intense the flavors going to be so, if you like a dark roast, you're going to want to go a little longer, if you like that lighter flavor, you're going to go for a light-colored bean and you're going to want to have some extra beans to play around with and have some fun with that, so we're just finishing these beans up. You can see they've taken on this gorgeous dark color and they get sort of this oily texture and we're thinking, this is about where we want our roast to be so we're going to turn them off and cool on and grind them up and boom, and we'll be back with you to taste them. Okay. so we just finished draining our fresh beans and now is the moment of truth. Let's see how they taste... Amazing!